"He does feed the birds in the back yard . . . "
He's not really a bad guy. That said, I must here add that he isn't anywhere as agile as I. I try not to laugh, but you should see him trying to tie his shoes in the morning. Though I mentioned him before, I suppose I should give readers more details related to his unexplainable influence over the Princess of Pleasure. It seems she finds his appearance appealing, though for the life of me I can't understand why. She mentioned that she found his company just as pleasurable as mine, but again, I'm at a loss to offer any elucidation. Weekday mornings he prepares coffee and serves juice beverages in bed to the Princess. I do understand the reason for his amorous glances and sighs as he watches her going about her Princessly duties. Even I confess she has the same effect on me, though she appears unexplainably swayed by his doting attentions rather than mine. Perhaps her heart is big enough to care for others as well as me. Remember what I said about his long winded conversations with who knows who? Lucky me, I found a pair of earplugs that helps reduce the tedium of a voice only he could find interesting. To humor him, and to create this important journal, I dictate and he writes it all down. He feels he's contributing something of merit to the world, and rightfully so. As yet, I haven't approved the final draft. Yes, that other guy. Maybe he's too befuddled at his age to learn much in the way of entertaining a Princess. He lays around most of the time while she does the work, always telling him to rest and take care of himself. And me? One might think she would be as concerned when speaking to me, would insist I take every opportunity to rest and keep my strength up while she's away. There's a mystery. Instead, she casts side-ways remarks, intimating that I should spend more time doing chores and such while he keeps to himself. Not one to cast dispersions myself, and pure of heart, I'll resist saying things that might reflect poorly on me. He's not really a bad guy. That said, I must here add that he isn't anywhere as agile as I. I try not to laugh, but you should see him trying to tie his shoes in the morning. He does feed the birds in the back yard and the fish in the pond, and seems to care about nature a great deal. Maybe if I play things right, I can get him to provide a few juicy grubs when I'm overcome with an uncontrollable urge to go native. Hmmmmmmm. I wonder if frozen grubs taste as good as those fresh from rotting foliage, or if caramel topping would add to the overall flavor? For the time being, I think I'll maintain a low profile until the right opportunity presents itself. One never knows when one might need an ally when moving into new and unknown territory. The Princess seems deferential to his wishes though I think she's coming around to see things my way. And actually, the other guy really isn't so bad. 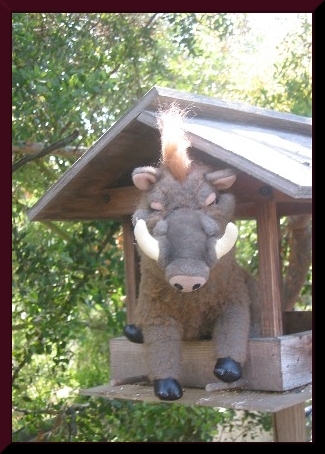 Naturally, he doesn't present any real competition for a warthog of my magnificent stature. Speaking of which, the moment has arrived wherein messages being delivered from my digestive tract puts me on notice that should I ignore them much longer, my general health and well being would be in serious jeopardy. Imagine the shock my readers might experience should I not be able to complete this important dissertation. Bearing with me then, I'll repair to a simple snack and just a reasonable bit of rest. Please, don't go out of your way to commend the biographer, for what is he but a simple-minded quill and paper recording the brilliance of the one dictating this masterpiece of important history.